The 2Face led National protest planned for 5th of February, is generating so much controversy.Most are in support of the African Queen Nigerian singer,but there are also those who feel he is misinformed or doing it for the wrong reasons.There also rumbles in the background that he has been paid millions by a powerful ex governor in Nigeria.The governor was said to have sponsored the musician over the years and gave he and his wife Annie Idibia gift of SUV Prado vehicles during their wedding in Dubai. his ex Plantashun boys bandmate an illiterate who needs to be educated about the facts. He also called him fake and said he only does things for himself and not the collective. 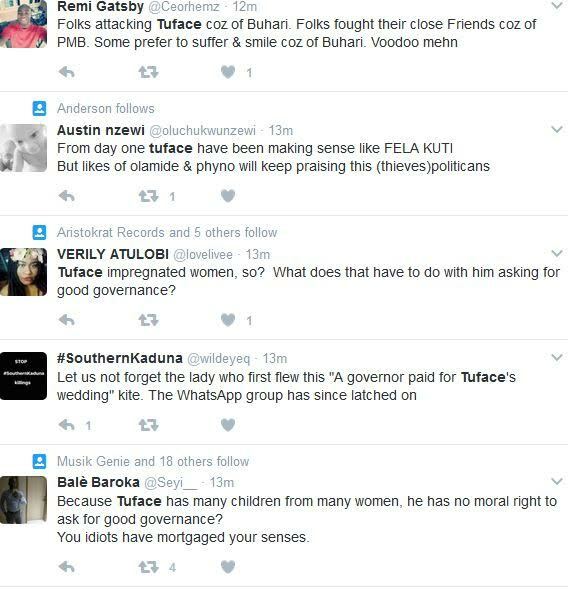 Another question being asked is why 2Face did not cry out when Goodluck Jonathan was in government.I guess you can never satisfy Nigerians. Blackface jumped on a criticism by a professor online who said the musician could not manage his private life let alone talk of national issues.He accused the singer of impregnating girls all over.I really don't understand what that has to do with anything though.Didn't Fela Kuti do worse in his private life?Didn't he speak out for the people? 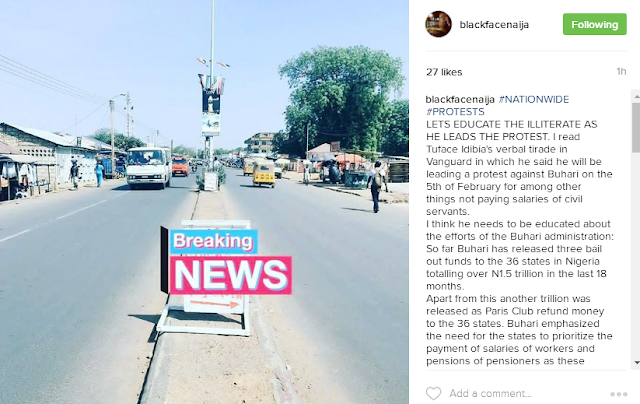 I read Tuface Idibia's verbal tirade in Vanguard in which he said he will be leading a protest against Buhari on the 5th of February for among other things not paying salaries of civil servants. I think he needs to be educated about the efforts of the Buhari administration: So far Buhari has released three bail out funds to the 36 states in Nigeria totalling over N1.5 trillion in the last 18 months. Apart from this another trillion was released as Paris Club refund money to the 36 states. Buhari emphasized the need for the states to prioritize the payment of salaries of workers and pensions of pensioners as these states receive the money. Unfortunately, instead of some states to use the funds to pay off civil servants and pensioners salary and pension arrears they chose to loot the funds. A governor of one of the South South states siphoned N3b of the funds using his mistress as a front and now the mistress has run away with the funds. 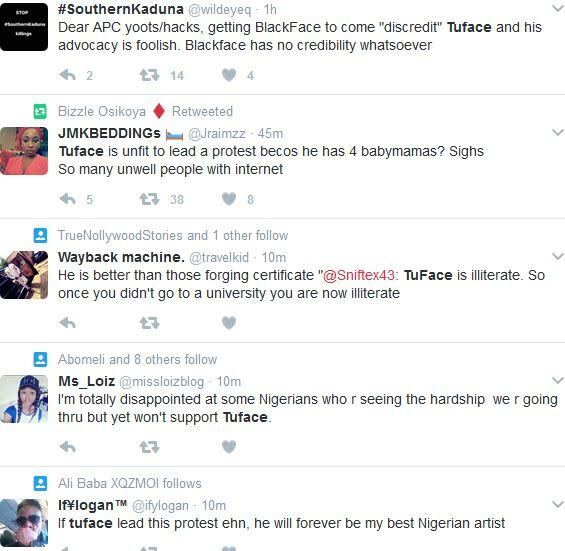 Idibia,you can now see why Nigerians are suspicious of the motive and source of the funds for the protest you want to embark on. Why didn't you lead a protest against these governors who mismanaged the Buhari bail out funds and the Paris Club refund money? Why did you not protest against GEJ's looting of N51 trillion naira and the Godswill Akpabio alleged looting of over N1 trillion naira from the Akwa Ibom state treasury for which he is being prosecuted by the EFCC? Why didn't you protest Akpabio's alleged corrupting of a Supreme Court justice who is currently being tried for corrupt practices on the bench? Is it because you are a corruption apologist? Is it because you are the agent of corruption fighting back? But the singer is resolute and has vowed not to turn back but go ahead with the protest. On his facebook page'he said in a video:'I will no longer be quiet. I'm just a musician with a point of view and the ear of my fans. I have dedicated my time and resources to peace building, voter education towards peaceful elections and youth engagement in governance in Nigeria. This march is about demanding that our leaders connect with all the people of Nigeria'. Another musician got involved in the debate when he told Blackface off for picking on his ex friend. 1. 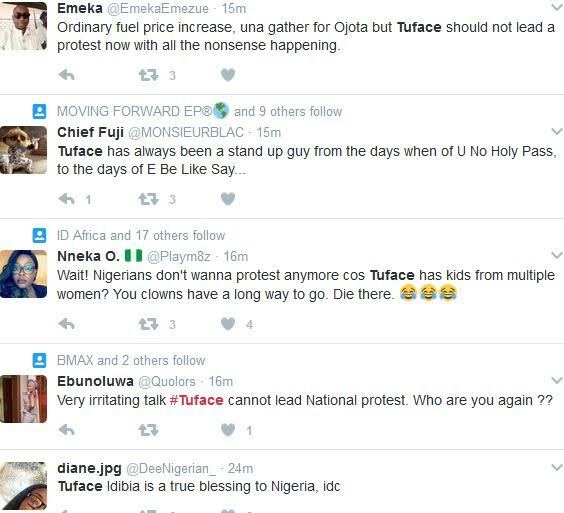 It is not a protest being lead by 2baba. He said he saw the post and thought to lend his voice to it. Something a few other artists and people have done. 2. So you knew about all the governors embezzling funds and yet you said nothing. But you are quick to shout now because 2baba name has come out on something. 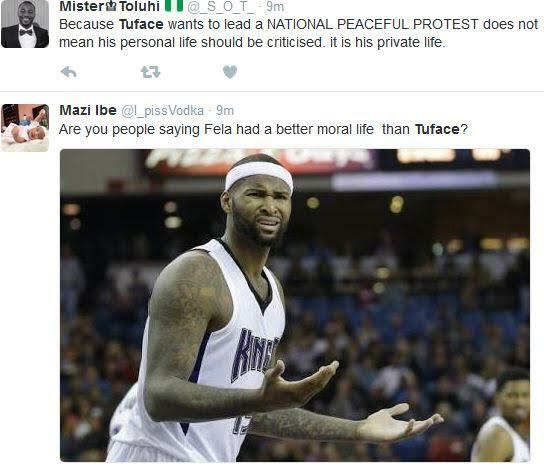 But you make it too obvious you have something against 2baba and you should have let all this go by now. NIGERIANS are suffering and you are just monitoring 2baba. 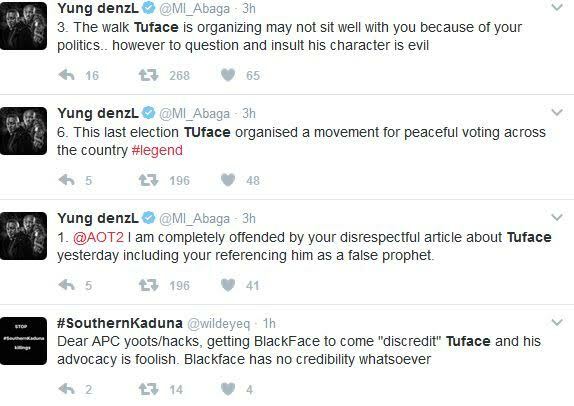 At least he has chosen to lend his voice to something all Nigerians believe is needed. What have you done? You have details that should be out there for all to see but you only decided to speak cos 2baba is involved. Guy change your ways. I know you as a crusader and not a 2baba hater. The people need voices that can be heard, I know you are one of them. Do the right thing brother. Life in Naija now is harder than it ever was and Buharis people should let Nigerians know what they are doing right and also let Nigerians know who and who is doing wrong. You cant say you are doing great things when the people cant feel it. You cant say you are fighting corruption yet not one corrupt official has been jailed in 2 years.